The second debate of Monday night was for the role of Education Officer, which is currently filled by Jonny Hall. The Education Officer represents the academic issues of undergraduate and postgraduate students and also oversees Student Council alongside the Chair of Council. The role is being contested by Adam Warner, Melanie Ann and Pablo Charro de la Fuente, all of whom were present for the debate, which was moderated by Jonny Hall and Julia McGee-Russell (NSR). The debate covered a breadth of topics and Adam and Pablo were able to utilise their experience as Chair of Council and International Students’ Officer respectively to aid their arguments. Different assessment formats were discussed with all candidates recognising that some students with mental health problems and physical disabilities may not be suited to traditional types of assessment. 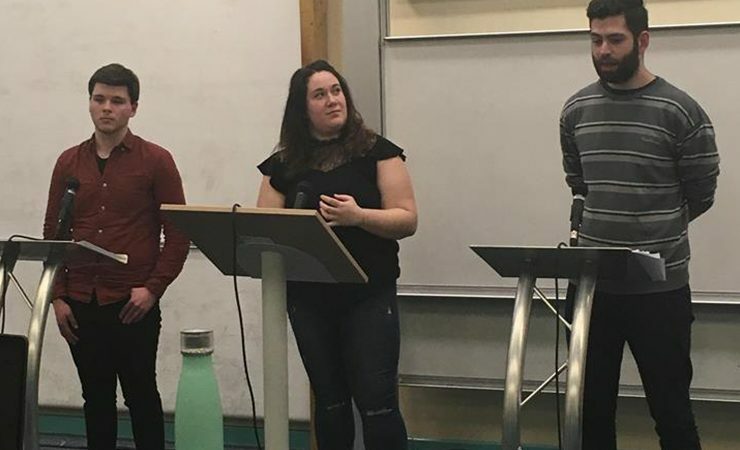 Printing credits were additionally mentioned on the manifestos of all three candidates, reflecting a wider problem experienced by many current Newcastle University students. Melanie suggested implementing a system whereby printing credits would be allocated to students dependent on their programme of study and factors such as whether they have to print a dissertation. Adam and Pablo on the other hand argued in favour of a system of transferrable printing credits. The representation of international students was a further issue discussed, with Pablo explaining how he would ensure liaison with the University to keep students constantly updated on how Brexit would affect their studies. Melanie said that, while the role would only last one year, she would ensure that the long-term implications of Brexit were considered too. Towards the end of the debate, the moderators were criticised for not allowing time for audience questions. The audience member argued that the format of the debate was not “democratic”. The moderators subsequently allowed time for the audience to ask the candidates questions.